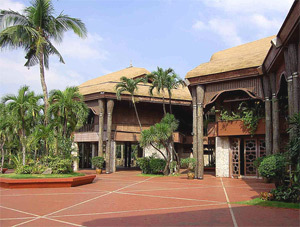 The Coconut Palace is almost entirely built out of coconut lumber, narra, and other native hardwoods. It’s named that way because 70% of the building’s materials came from the coconut tree and practically every furnishings in the palace has coconut in it, with the coconut shell chandelier and the intricate coconut dining table among the masterpieces. The palace contains seven bedroom suites, each representing a region of the Philippines: Bicol, Iloilo, Marawi, Mountain Province, Pampanga, Pangasinan, and Zamboanga. (The Marcos’ favorite number is seven.) Outside, there is a magnificent pool and grassy lawn, with planted coconuts (but of course!) overlooking Manila Bay. Nowadays, the palace serves as a museum. Tourists can visit it during the day after paying an entrance fee of 100 pesos and tour guides will be glad to show the interiors of the Coconut Palace. However, visitors are not allowed to stay overnight. The lawn and pool area can be rented for events and occasions, and many wedding receptions have been held on its grounds. See more pictures of the Coconut Palace or read this informative travel guide. The corresponding Wikipedia article could use some improvement though.